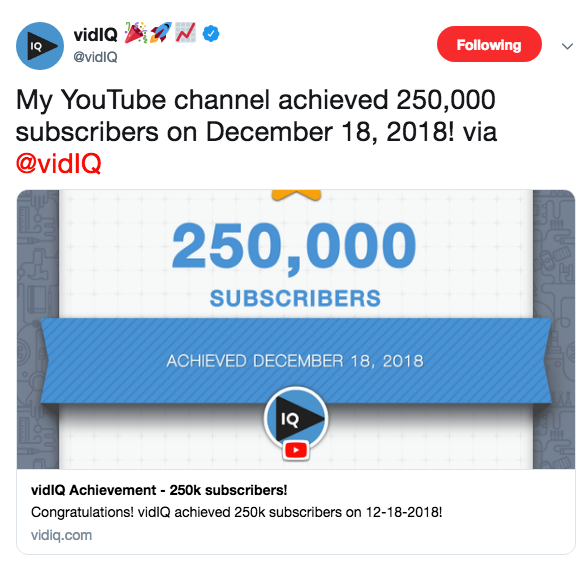 Introducing our brand spankin’ new vidIQ Achievements tool, empowering YouTubers to define, monitor, achieve and celebrate their unique milestones at a glance. Set channel milestones for subscribers, views, uploads, likes, hours watched, and comments, and peep your best performing months for the same metrics — for free (YUP). 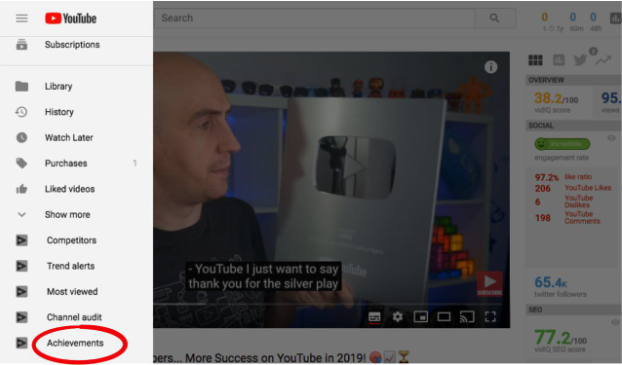 When vidIQ surpassed 100,000 subscribers, we were awarded the Silver Creator Award (thanks, YouTube! ), however, since then we’ve achieved some pretty significant milestones… ones that don’t come with shiny plaques. Ending 2018 on a high note as we surpassed 250,000 subscribers. Milestones, like fingerprints, are unique to each individual. Our definition of a milestone may be different from yours, so it makes sense that we should have the ability to celebrate milestones by the metric and measure of our choosing. 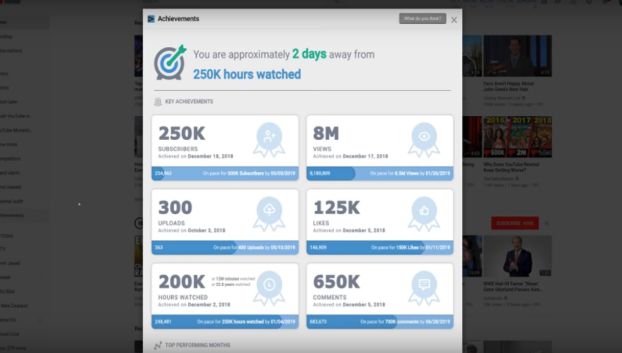 The Achievements tool gives you that flexibility — whether you&apos;re aiming for your first 100 subscribers, your first 5,000 views or 10,000,000 hours of watched time, our tool will track a milestone if it&apos;s relevant to you, no matter the stage of your YouTube journey. If you already have the free vidIQ Chrome extension, you can access Achievements on the left-hand navigation bar of most YouTube pages. When you click on it, you’ll see six key achievements from your channel: subscribers, views, uploads, likes, hours watched and comments. 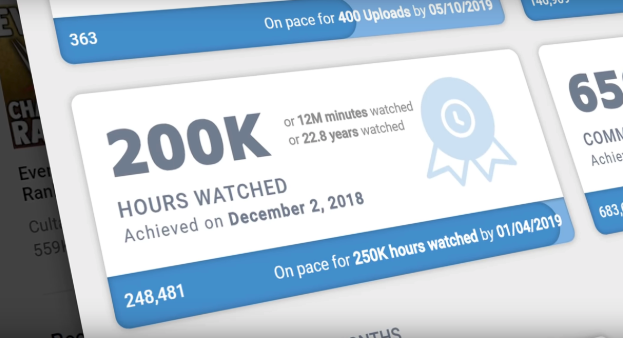 The headline achievement is always your next expected milestone, so in the case above, vidIQ is expected to smash 250,000 hours of total watched time on the channel in just two days time. Zoom into the Hours Watched key achievement to see a further breakdown of your most recent milestone achieved, including the date, minutes watched and even years watched. Keep an eye on the progress bar along the bottom of each metric to gauge when you’re forecasted to hit your next milestone. So what do you do when you actually achieve your milestones? You celebrate them, of course. Click on any of the key achievement boxes to instantly create an achievement or certificate to share on social media. In the example above, we hit 125,000 likes in December of 2018 — an achievement we shared with our Twitter followers. 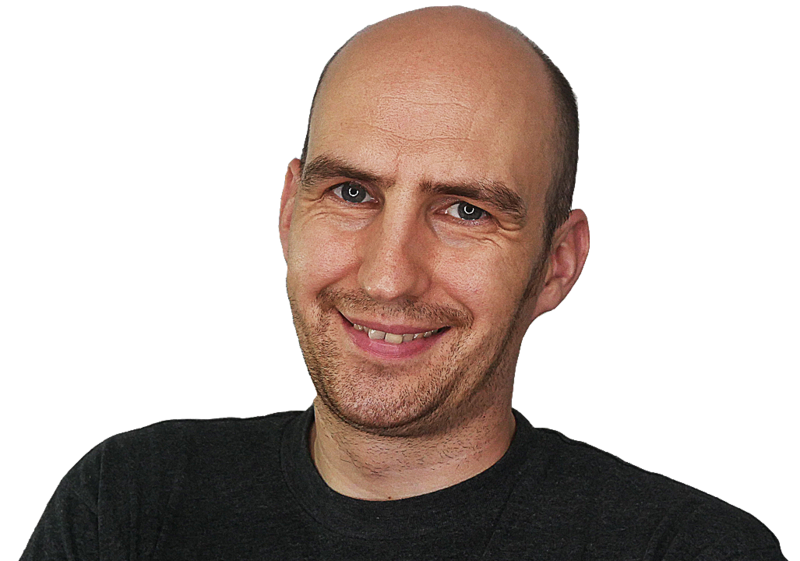 To do the same, simply select the Twitter icon to automatically generate a tweet complete with text and an image, click on “Tweet” and there you are, job done. We could have stopped there with the Achievements tool, but we wanted to add a little extra spice by giving you visibility into your best-performing months for the same key metrics. From the Achievements screen, simply scroll down to see how you’re currently fairing compared to your best months. For example, in December 2018 vidIQ had its best month yet for subscribers — 18,600 of ‘em. The progress bar along the bottom shows how we’re tracking for the current month. At 1,123 subscribers, we’ve got some work to do to match a monumental December. The diamond symbol represents your best ever month&apos;s performance — mouse over it to confirm the date. Of course, just like key achievements you can click on any of these boxes and share your success. Now (full disclosure) there is one more section in the Achievements tool which to be honest, is a little undercooked right now, and that’s the Top Performing Video section. At the moment it displays the video on your channel with the most views. We’d like to add additional metrics (such as the video with the most watched time or the video that’s generated the most subscribers) but we want your input. What would you like to see in the Top Performing section? Let us know in the comments below. And if you love Achievements but you&apos;re wondering how on earth to get it, this is just a tiny piece of a super powerful tool. 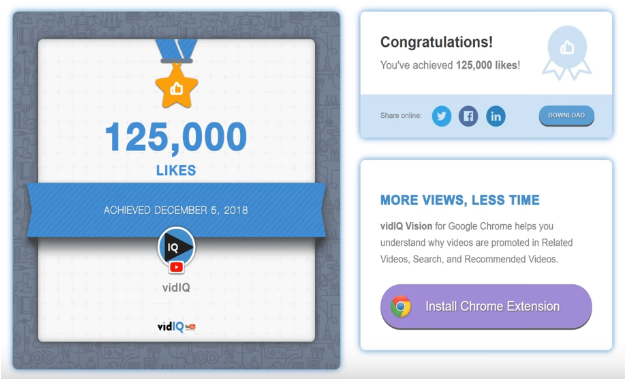 Research YouTube, analyze videos, audit your own channel, take actionable steps and track your milestones… all for free with the the vidIQ Chrome extension. Success on YouTube isn’t always about tracking just your metrics – it’s about gaining valuable insights into your competitors too! What happens when you are overwhelmed with too many comments? We’ve created filters that help you find the comments that matter.